I don't know why popovers aren't more of a thing? Are they a thing where you live?? All I know is I had never heard of one, much less had one, until a couple years ago via this bloggy-verse I inhabit. And I looove them! 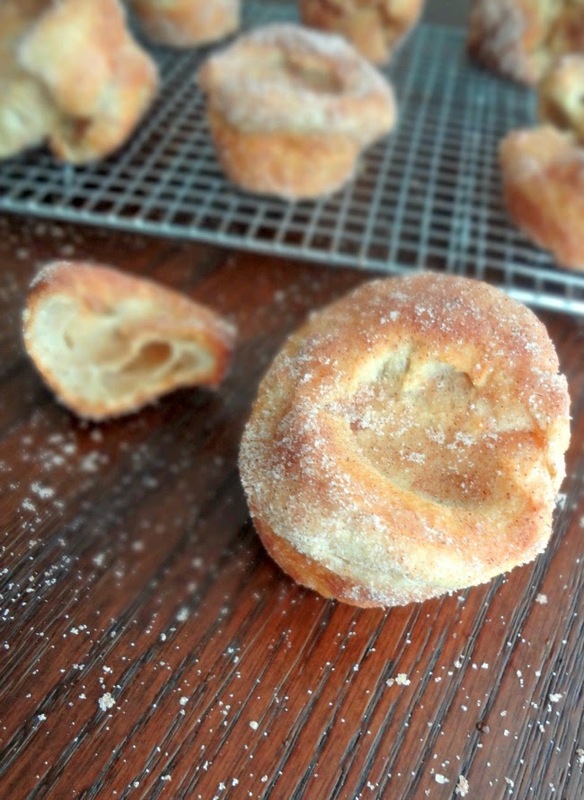 They're like...part pastry, part roll, part donut (like, the freshly fried dough kind, not the Dunkin Donuts kind). And how easy are popovers to make? SO. DANG. EASY! Again...why are these not more of a thing??! I don't know what it is...but there's something about biting into a crunchy coating of butter and cinnamon sugar, and then being greeted by an airy, yet chewy, center that is just...heaven. I would not be too surprised if I saw a little baby angel fly out of one of these lovelies. True story. I mean...magic has got to be involved. Somehow a tiny little amount of batter rises up into these gorgeous pillars-like....what's the science involved?? I have absolutely no clue. Sooo....let's just call it magic. If I was one of those super cool people that I see all the time on Instagram or that I knew back in NYC, I would create a beautiful tablescape (with some stunning flower arrangements-maybe peonies-in a vintage "oh I just had this laying around and it happens to be super artsy" kind of way. Ditto to a bunch of mismatched plates and maybe mason jars as glasses.) and serve brunch to my super cool group of friends, and I would probably have mimosas (using fresh squeezed orange juice), local and organic milk, a bunch of beautiful jams and honeys, European butter, waffles, French toast, and various pastries-INCLUDING these popovers. 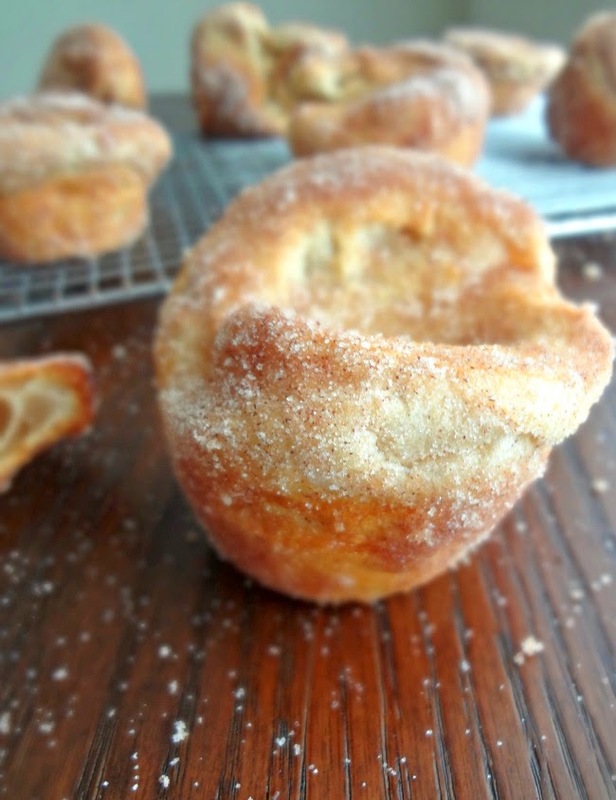 Well...even though I am positive I could never in 100 years make the rest of that artsy, hip, lovely brunch happen, at least I've got these cinnamon sugar popovers! 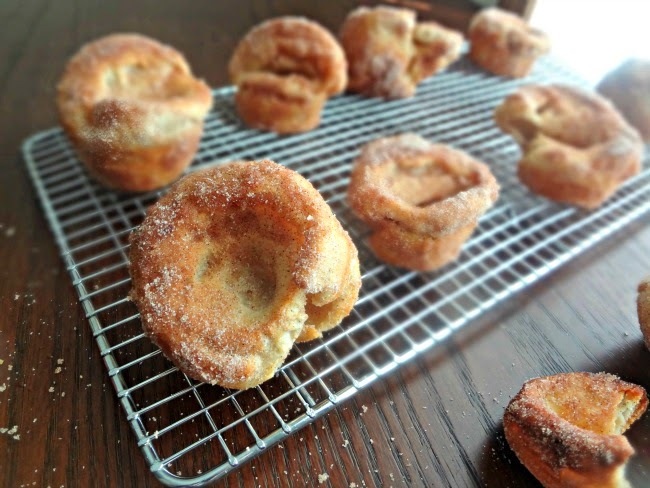 Theoretically you could coat these popovers in anything you want (omigosh I wonder if I tossed them in powdered sugar if they would taste even more donut like??!) but...cinnamon and sugar just scream DELICIOUS BREAKFAST to me! You can also drizzle some honey on there. Or serve with jam. But...again...I liked them just like this. Don't mess with perfection my friends! ...Unless you want to, totally do what you want. In a blender, blend together the milk, eggs, and 1 tbsp. of melted and cooled butter until combined. Add flour, salt, vanilla, and 1/2 tsp. cinnamon and blend until smooth and frothy. Now preheat the oven to 450F degrees (letting the batter rest during this time improves the texture). 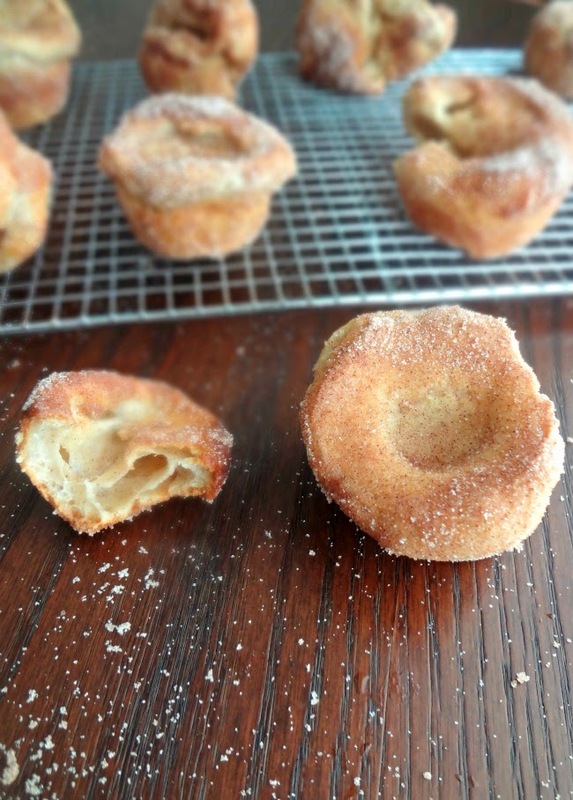 Once preheated, place a popover or muffin tin in the hot oven for 2 minutes. Remove from oven and brush the cups (all of the cups for a popover tin and only 8 cups in a muffin tin) with oil. Pour batter into each prepared cup, filling up about halfway. Bake 15 minutes and DO NOT OPEN THE OVEN AT ALL DURING THIS TIME! Reduce oven temperature to 350F degrees and bake for 15 more minutes, until golden brown, dry to the touch, and fully cooked inside (you may open the oven during these 15 minutes). While baking, mix together 1 and 1/2 tsp. cinnamon with the granulated sugar in a plate or shallow bowl. Empty finished popovers onto a wire rack to cool and pierce the bottom of each popover with a sharp paring knife to allow steam to escape. Cool until they are comfortable to touch. 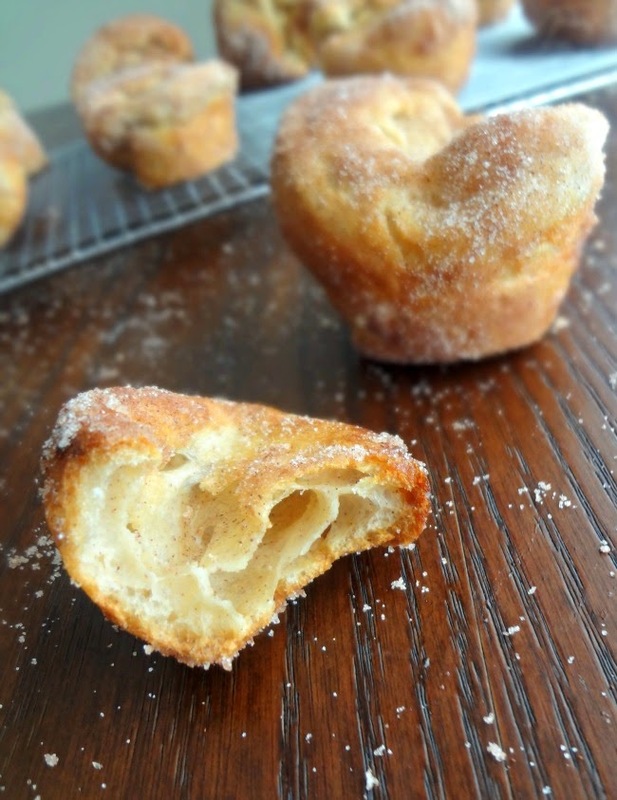 Brush each popover with melted butter and then roll in the cinnamon sugar mixture, until fully coated. Do you think I licked the sugar off that table? WELL....I didn't, actually. One of my regrets. We all make mistakes.